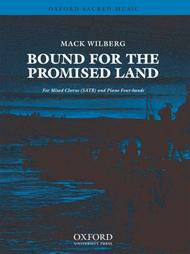 Bound for the promised land composed by Mack Wilberg (1955-). For Mixed Choir (SATB) & Piano 4-Hands ([piccolo, 2, 2, 2, 2-4, 3, 3, 1], timpani, 2 percussion, harp, strings). Mixed Voices. Sacred. Vocal score. 12 pages. Duration 2.5'. Published by Oxford University Press (OU.9780193869172).ISBN 9780193869172. Sacred.For SATB and piano four hands or orchestra. This American folk hymn captures the optimism and strength of the early pioneers through musical textures and sounds of the old west. This is a joy to perform, especially as the rhythm becomes syncopated and elongated reflecting the spirit of folk-dance. An orchestral accompaniment is available on hire from the publisher.